These boots are perfection. The brown of the leather looks more inviting than a worn-in couch and stacked wooden heel is an optical delight. I wonder how they make a heel with such a detailed design. 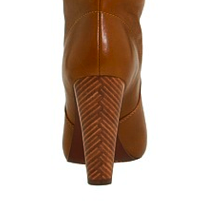 Only a super fine, super class lady would or could wear these Elie Tahari boots. But how practical are these for walking around campus? The cobblestone would likely devour the pretty perfect wooden heels. Taupe Boots, s'il vous plai. No Shave November, No Point? Major in happiness, minor in fabulosity! Would you pay 2k for a paper? Never fully dressed without a scarf!